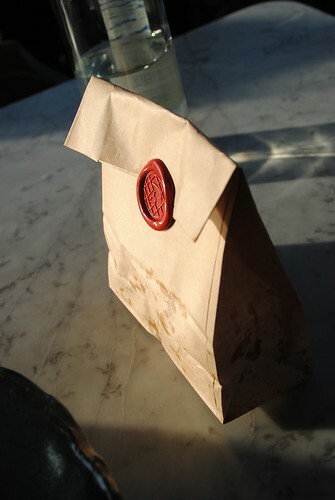 Mr B and I went to Duck and Waffle the other week. Here’s a few words and pictures to share our experience with you. a seat looking out over our capital as the sun down. we tried to resist the urge to crane our necks and see what others are eating. We failed, and ended up ordering an extra dish – a garlic and rosemary foccacia. Dishes are either small sharing plates, or “for the table” which could be a main course if you wanted to be selfish, but it’s equally encouraged to share these amongst the table too. Because of this there is no order to the arrival of the food and items are served as they are ready. First up for us was pearl barley & wild mushroom ragout with goat curd and 63 degree hen egg. I’m not certain that it was actually a 63degree egg, as I wouldn’t have expected it to be browned. 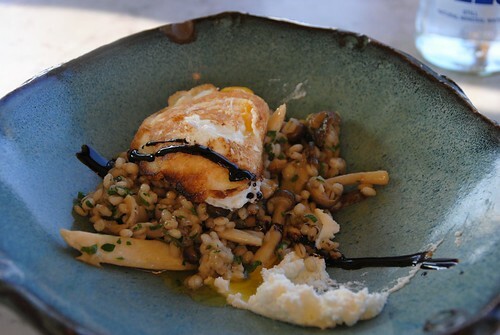 That said, when the yolk melted into the nutty pearl barley making the grains stick together with the musky mushrooms and creamy curd – well, I wasn’t really thinking about the cooking temperature of the egg. and that garlic and rosemary foccacia bread, which was made to order. 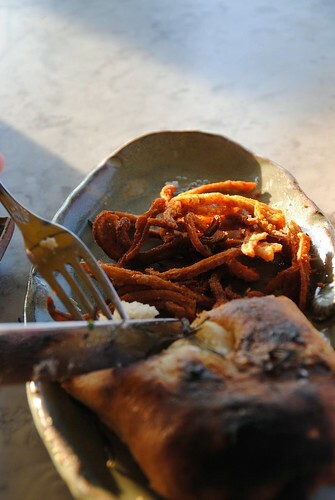 The pig ears were like superior pork scratchings, only with an intense savoury flavour and with just a little more chew to them thanks to the sinew of the ear. I should have taken some photos of the dish as we served it out, but I was too busy eating to care. Instead you will have to take my word for it that under the crumbly slightly crunchy topping lay a beautifully silky lobster cream and soft yet bouncy pollock meatballs with, I think, a touch of lemon zest that cut perfectly through the rich sauce. 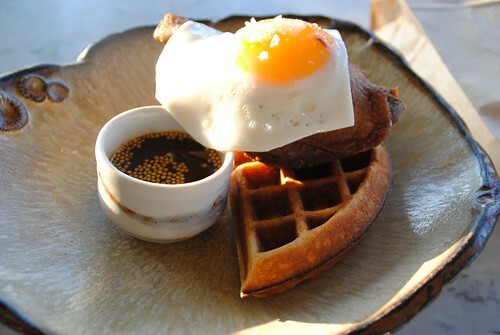 Last of all, we had to have the eponymous crispy duck leg confit with fried duck egg and mustard maple syrup served on a waffle. The restaurant is open 24hours a day and I imagine that this dish would make a great brunch item. For me it was the mustard in the maple syrup that pulled it all together – adding a touch of fire to an otherwise very sweet dish (not in a bad way). The duck leg was like eating Chinese crispy duck and fell apart as we tried to cut it. You can see from the photo how well the egg was cooked. 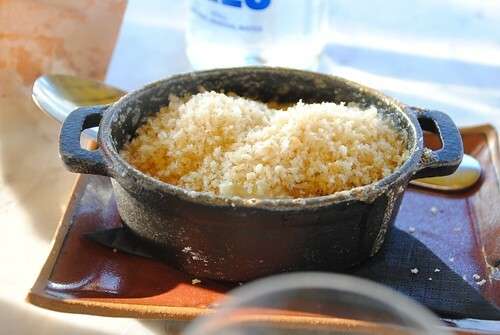 Another great dish and one that sealed the fate of the desert menu never to make it past the ‘look with longing’ stage. There were a few pudding items that we’d have been more than happy to sample were it not for full stomachs and having had the sugary finish of the maple syrup to satisfy us anyway. 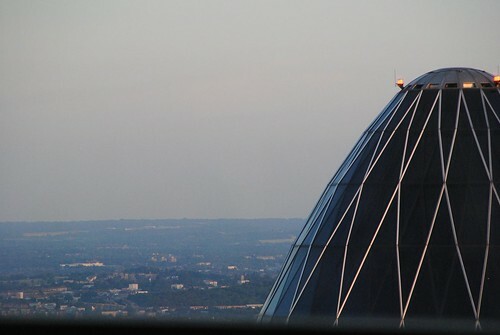 Restaurants with a view have a reputation for overcharging and getting away with distinctly average food. This (and Galvin at Windows) seems to be an exception to the rule. 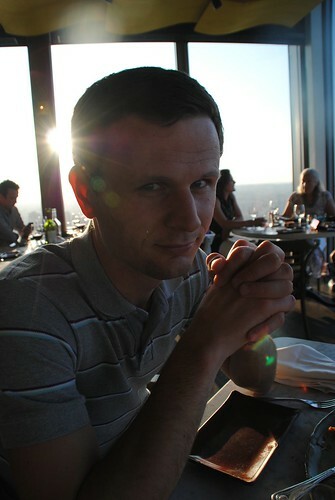 Our meal came to £63 inc service and a bottle of water which, whilst hardly pocket money seemed like very good value, especially when you think that it would have cost us £50 for the view alone from the Shard. 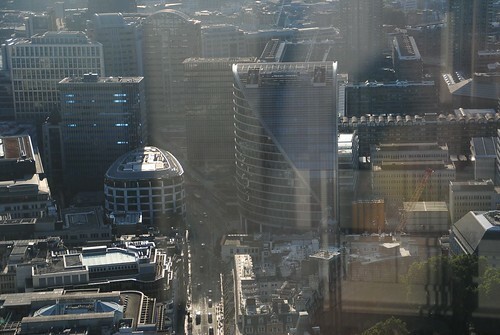 This visit was was a celebration (new job) but we had wanted to go for a while – partly for the views, partly for the food and partly because Mr B Snr’s past employer helped build Heron Tower. 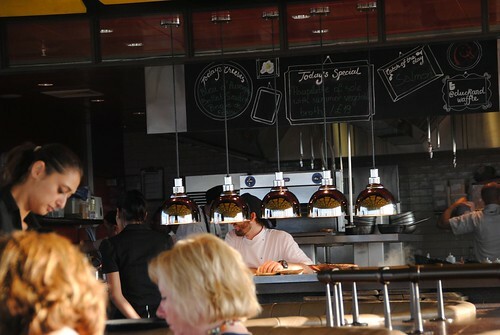 Reservations are hard to come by, so thanks very much to Ashleigh of Girl About Town for helping us get a table. 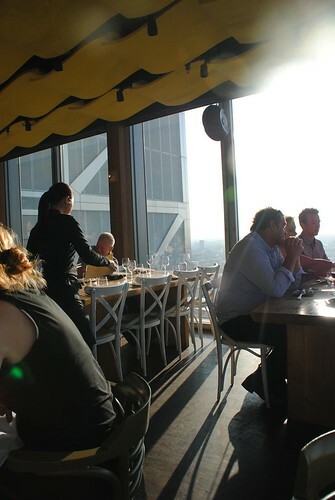 Her blog reviews all the best restaurants, night spots and events in London and the surrounding areas. Do go and have a read – that girl goes to the swankiest places (most of which are far too cool for me!) As usual, all views are my own and you can be doubley sure as this wasn’t a freebie – we went under our own steam and paid for it all ourselves. 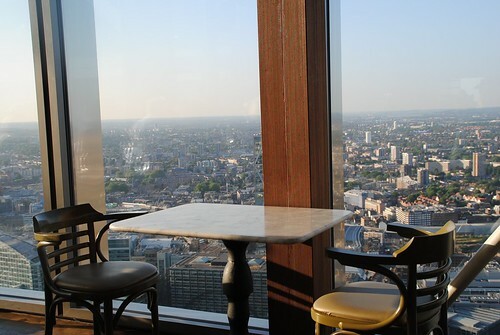 Also well worth a visit is the Drift bar at the base of Heron tower, though not on a busy summer’s evening – go on a Saturday lunchtime and it offers excellent service and good value. That looks amazing – I was wondering what that place was like. I’ll have to look at the menu though as unfortunately my boyfriend is very fussy and wouldn’t eat a single one of the things you mentioned!